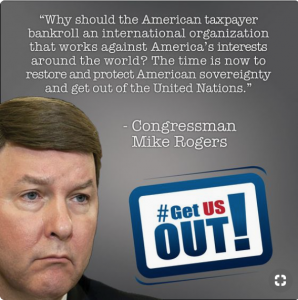 Republican Congressman Mike Rogers of Alabama has just introduced a bill to pull the United States out of the corrupt, Islam-pandering United Nations…and then kick the United Nations out of New York City. 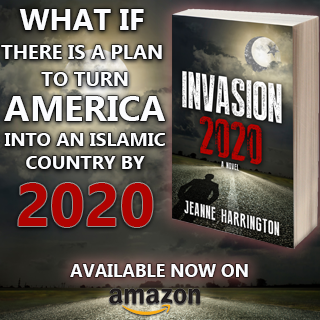 This certainly isn’t the first time it’s been proposed, but perhaps now, with a serious anti-globalist as president of the U.S., it will get the attention and action it deserves. 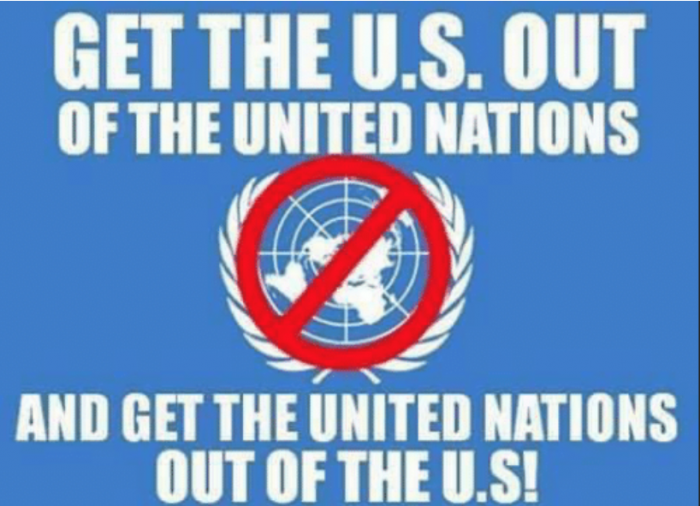 The New American As outrage over the United Nationscontinues to grow, legislation to restore American sovereignty by withdrawing from the scandal-plagued UN was introduced in Congress this month. In addition to getting the U.S. government out of the UN and evicting the global outfit’s headquarters from U.S. soil, the bill would end American involvement in the full panoply of UN agreements and agencies. It would also prohibit putting of U.S. troops under UN command. It would be wonderful if Trump removed the US from the UN. The UN is a New World Order organization that is the enemy of free nations, which we hope the US will continue to be. Could this finally spell the end of the UN? I’ve been saying for years that this pit of corruption needs to be rooted out, fumigated (so that its toxins don’t leach into the wider environment), then buried like nuclear waste. Good riddance to this waste of space. Not the best quality video, but good info. Rid the USA of the UN, yes, but to really become a free nation again, we must also eliminate the Federal Reserve. We must end the reign of international globalist bankers over our money and economy. Rashid Tla-pig, the other islamist congress reptoid and CAIR would be extremely offended if the U.N. was moved back to Geneva or relocated to Qatar which it primarily serves. I love it but fear it has no chance of getting out of the House since the Demonrats are in control. It didn’t make it out of the House when Republicans were in control either. The UN is one of America’s enemies. I will believe it when I see it and the UN building is used to the advantage of America. For something good and all UN scum are out of America. We need to mobilize and petition President Trump to promote this. The Anti-Freedom, ANTI HUMAN RIGHTS, JEW HATER, CHRISTIAN HATER, American Hater, Israel Hater, NWO UN is the ENEMY of EVERY non-Muslim on earth. 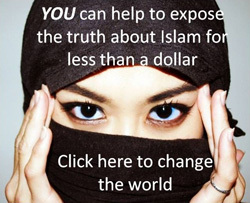 It is a CRIME that any non-Muslim nation is FORCED to finance the UN MONSTER. till the 80s children learned it in school that it is only a ceasefire. Also it was reported that back in time the Communists in the USSR knew all secrets because of the UN. I used to say the UN is a useless and extremely expensive body. Now, I would replace ‘useless’ with hateful to the US or traitor. 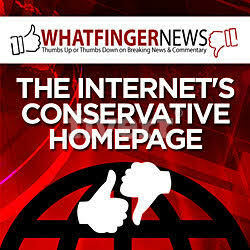 I agree 100% with Congressman Roger that the UN is disastrous. Why are we still supporting it is outrageous. The John Birch Society has sponsored its Get US Out campaign for most of its 60 years of existence. Did you know that it was the Rockefellers, John D’s sons & grandsons, not John D himself, committed to world government, who gave the money to buy the land in NYC where the UN would be placed. 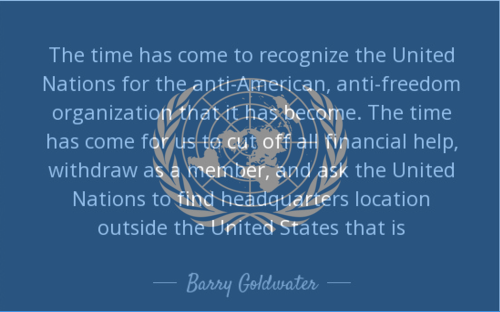 Putting the UN directly in the USA was a deliberate stab to the heart of freedom. When the US Senate refused to join the League of Nations (1919) its HQs were placed in Geneva, but the USA was desired. The globalists reasoned then, as they reason today, if we can topple the people of the USA, the rest of the world will easily fall in line. Their reasoning is correct. All efforts are made at taking the USA down, down, down. Yes, I did. I used to live a block away from the UN and couldn’t stand the demonstrations they held there on a regular basis. What a brilliant idea 100% agree with this .The UN picks the easy mark as long as it does not upset the the money suppliers .The ultimate example is Saudi Arabia Human Rights committee .Does the UN think we are that gullible and how about some response to the horrendous crimes committed in the name of so called religion .in Africa and Asia and dont mention Islam the main offender . Thanks to these two senators, but I don’t think this can pass in a Demonrat Congress. So, who you gonna call? TrumpBusters! I believe that the United States of America should pull out of the United Nations and have them move their Headquarters out of the United States. The United Nations is extremely biased against the Nation of Israel. The United Nations is also heavily influenced by the Organization of Islamic Cooperation, which is made up of over 50 Islamic countries. Also the United Nations wants to establish globalism thru the Migrant Immigration Pact. The United Nations wants to take away United States Sovereignty as an independent Nation. Also the United States provides way too much funding to the United Nations. It is good that President Trump has cut back funding to a number of UN organizations. It is time for the United States to pull out of the United Nations and work more with the other nations thru the State Department thru diplomatic relations with the various nations. Critical thinking: Stay close to your friends and closer to your enemies. Although I despise the UN, the only way to keep them under control is to keep them under our territory. As much as we would like to move them elsewhere, we’ll have less control over them aka less surveillance. The best thing that America can do is to defund the corrupt U nations and do it now. This corrupt organization is controlled by the OIC a monster organization of 57 muslim countries that vote as a block. Save billions in tax payers money and stop 20% of the funding and the UN will fail. 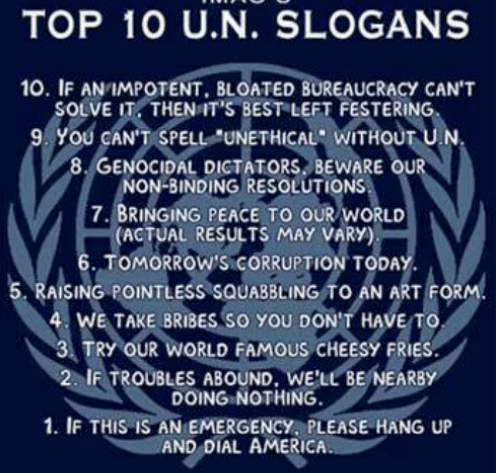 Only fools would continue to fund this corrupt organization the UN that hates America and all democracies. Trump has cut a lot of US funding for UN organization. Now he needs to cut the rest.